A low pressure area that has been lingering near Vanuatu in the Southern Pacific Ocean has consolidated into a tropical cyclone. 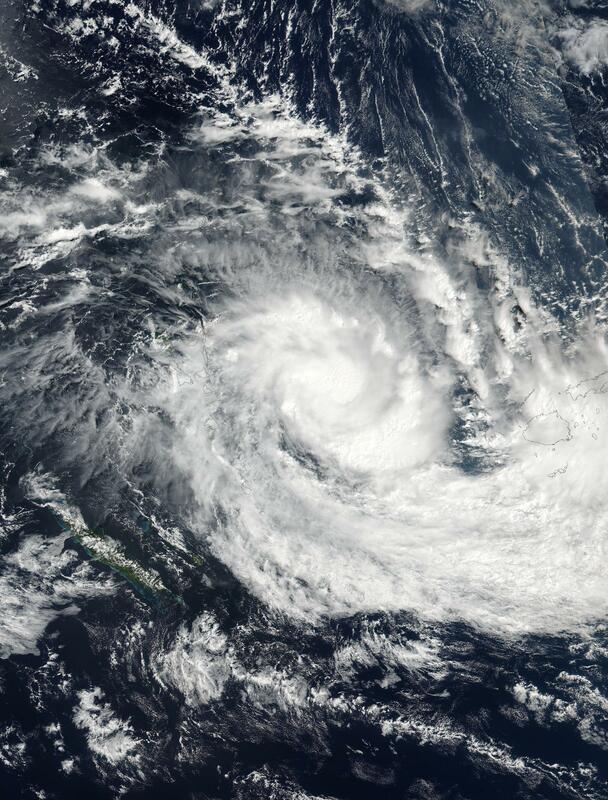 NASA-NOAA's Suomi NPP satellite passed over Tropical Cyclone Keni on April 9. After the low pressure system that had been raining on Vanuatu moved away from the island nation, it intensified, organized and developed into a tropical cyclone. On April 9 at 0230 UTC (April 8 at 10:30 p.m. EDT) the Visible Infrared Imaging Radiometer Suite (VIIRS) instrument aboard NASA-NOAA's Suomi NPP satellite captured a true-color image of Keni. Keni had moved between Vanuatu to the west, and Fiji to the east. The VIIRS image showed the center of circulation surrounded by a thick band of thunderstorms wrapping from the southeast into the low-level center. A Storm Warning remains in force for Southwest Viti Levu, from Nadi through Sigatoka to Coral Coast, Mamanuca Group, Beqa, Vatulele, Kadavu and nearby smaller islands [Matanuku, Ono and Galoa]. A Gale Warning remains in force for the rest of Viti Levu, Yasawa Group, Lomaiviti Group, Moala, Totoya, Matuku and Southern Lau Group. A Strong Wind Warning remains in force for the rest of Fiji, and a Heavy Rain Warning Remains in force for all of Fiji. A flood warning remain in force for low lying areas, small streams and areas adjacent to the downstream areas: Nasivi Station to Tavua Town; Ba River to Toge Station To Ba Town; Vatukacevaceva Station to Rakiraki Town; and Dreketilailai Station to Qawa River. A flood alert remains in force for low lying areas, small streams and areas adjacent to all major rivers of Fiji and for low lying areas, small streams and areas adjacent to the downstream: Tuva River and Low Lying Areas; Votualevu and Mulomulo Stations to Nadi Town; Keyasi River to Sigatoka Town; Nabukelevu Station and Sabata Station To Navua Town. At 1500 UTC (11 a.m. EDT) Tropical Cyclone Keni was located near 17.8 degrees south latitude and 174.6 degrees east longitude. That's approximately 266 nautical miles west of Suva, Fiji. Keni has tracked eastward at 12 knots (14 mph/22 kph). Keni has maximum sustained winds near 55 knots (63 mph/102 kph) and it is expected to intensify to 80 knots (93 mph/148 kph) by April 10. The system is expected to keep tracking southeastward and intensify further as it moves toward Fiji. The storm will start to become extra-tropical after a day or so.